Join us for FREE lunch and informal discussion with Faculty/administrators about their current research/work in progress. Originated in 2004 and currently supported by the College of Arts & Sciences, the Latina/o Studies Program Fridays with Faculty seminar offers an opportunity for Latina/o and non-Latina/o students of all levels and disciplines to meet faculty and administrators from across the university for informal conversation and lunch. 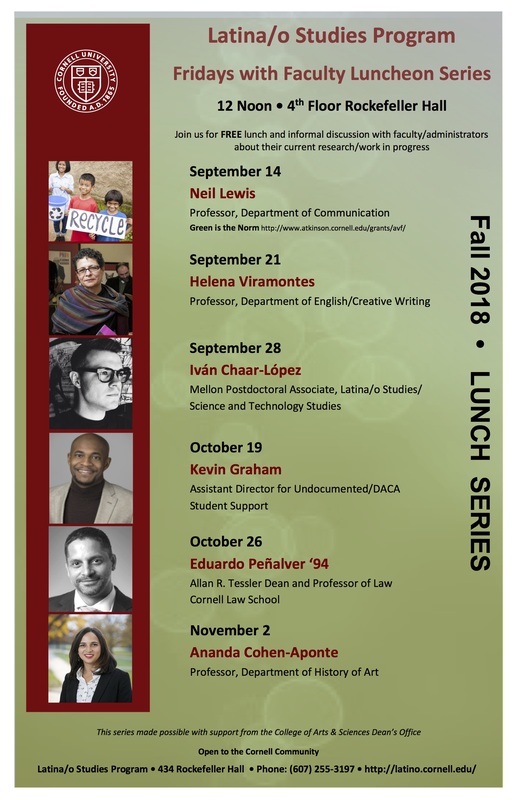 The program features speakers with some connection to Latina/o Studies or the Latina/o experience at Cornell and provides a significant alternative academic component for the LSP community. The seminar also serves as a cornerstone retention program as it builds connections and sense of belonging among undergraduate and graduate students, staff and faculty, and increases students' use of Cornell's academic resources.